Season's greetings, the EAA-AAA Joint Membership, the EAA Flemming Hansen Award 2015 and more. As time goes by, a trend toward global research collaboration has changed the nature of the EAA. Our membership is no longer limited to a single region—namely, Europe. In the last ICORIA, in Amsterdam, we received more than 150 participants from nearly all regions, including North America, Asia, Australasia, and Africa. Given this trend, the EAA has decided to take a step towards ensuring our future growth. We will start a trial joint membership with the American Academy of Advertising (AAA) in January 2015. In this strategic alliance, members will enjoy all membership benefits of both organizations. 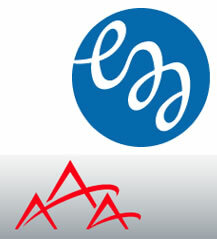 We hope this EAA-AAA joint membership will serve as a catalyst to further our internationalization. Facing the challenge of this new global alliance, the EAA needs to improve our membership relations, as does our Web site. We are planning to update the EAA Web site so that our members can access past conference proceedings, along with other resources, through our membership only page. We hope to launch our new site by mid-January 2015. Celebrating the 10th anniversary since its founding, the EAA has created a new award named after the late Flemming Hansen (Copenhagen Business School). In 2002, Professor Hansen held the Forum for Advertising Research Conference, which became the first ICORIA. Four years later, he founded the EAA at the 4th ICORIA Saarbrucken, and served as the first President for two years. This award recognizes a scholar who has produced publication(s) with significant impact in our knowledge of advertising research. We hope that this award keeps Professor Hansen’s scholarly spirit alive in our hearts. We’re looking forward to 2015, which will see the ICORIA London with a newly designed doctoral colloquium, Advances in Advertising Research VI, the EAA-AAA joint membership, and much more! The European Advertising Academy (EAA) is seeking nominations for the inaugural Flemming Hansen Award. This award honors a scholar who has made contributions to distinguished scholarship in advertising research. Specifically, the EAA will recognize an author of one or more publications that had a significant impact in the field of advertising. The 2015 recipient will be announced at the Gala Dinner of the 14th International Conference on Research in Advertising (ICORIA) in London on July 3, 2015. Please see the conference call for papers at the EAA Web site. The EAA will consider self-nomination as well as nomination by another person or organization. All nominees will be considered against the same criteria. Nominees and nominators should be members of the EAA. The Selection Committee consists of the past EAA Presidents: Professor Peter Neijens (University of Amsterdam, the Netherlands), Professor Ralf Terlutter (Alpen-Adria University Klagenfurt, Austria), and Professor Edith Smit (University of Amsterdam, the Netherlands). Please send nominations and any questions related to this award to the Selection Committee Chair, Peter Neijens, at P.C.Neijens@uva.nl. Include the candidate’s CV with the nomination letter, which should describe significant contributions to distinguished scholarship made by the nominee (maximum one page). Nominations for the 2015 award must be received by May 1, 2015. Advances in Advertising Research are published by the European Advertising Academy (EAA). This volume is a compilation of research presented at the 12th International Conference in Advertising (ICORIA) which was held in Zagreb (Croatia) in June 2013. The conference gathered 105 leading researchers from 23 countries under the conference theme “To Boldly Go... Extending the Boundaries of Advertising”. The book provides international state-of-the-art research with 23 articles by renowned scholars from the worldwide ICORIA network. 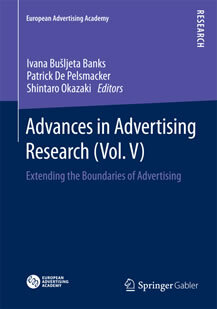 The book series “Advances in Advertising Research” is published by Springer Gabler and can be ordered on amazon.com. More information about the series and links to Amazon can be found on the publications-page of the EAA-website. 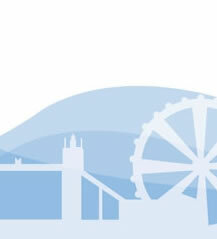 The 14th International Conference on Research in Advertising 2015 will be held in London, UK, one of the most exciting cities in the world. The conference theme "Bridging the Gap" embodies the need for closer collaboration between advertising academia and practice. If you are interested in presenting your work at the ICORIA 2015 conference please submit a five page summary of your paper as soon as possible (but no later than March 15, 2015) to: papers@icoria.org." The full call for papers can be found here. The EAA Board member, Martin Eisend (European University Viadrina) will guest edit a special issue of the Journal of Advertising on 'Re-inquiries in Advertising Research'. Special issue co-editors are George R. Franke (University of Alabama) and James H. Leigh (Texas A&M University). Papers should be submitted before January 31, 2014. For further information please download the Call for Papers.